For myself, the essence of Fall this year, is best represented by deep, inky indigo hues. Indigo in its nature is a hard color to peg. On its own, it relays a thousand shades and more depth than you could ask for. But, when pared with a complimentary color, its true tone- blue or purple- comes to life. 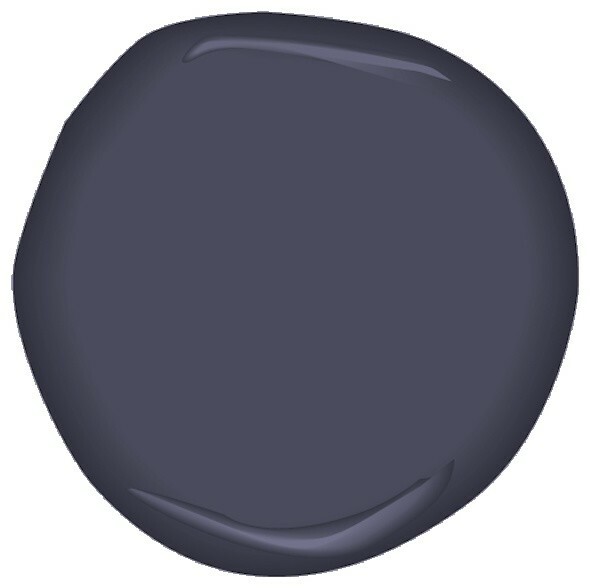 This week's color is from Benjamin Moore's new Color Stories line, and is called Approaching Storm CSP-535. It is a moodier indigo, and carries a muted gray tone about it. A color like this can stand on its own, and really doesn't need to rely on a brighter accent to carry it through. I see this shade working well for a dining room- one with crown molding and architectural interest. I could also see this color working well in a bedroom, casting a dark shadow to emulate the nighttime sky. I must admit, that my recent indigo obsession was spurred on by the candle featured above. It's from Pier 1, and the fragrance is called "Indigo Blues" and contains notes of cedar, patchouli, and musk. I've pretty much had it burning non-stop, every evening, for the past few weeks. When picturing Fall-time imagery, most direct their thoughts immediately to burnt orange and golden tones. This year, I like to consider the inky indigo that truly is the Fall's dusky approach.